The North High School Art and Science departments invited Harrison students to participate in the inaugural “Protect Our Watershed Expo”. This event was presented by the City of Davenport and North High School on March 10, 2018 from 10am – 3pm at the River Center. The theme for the expo was “Getting Ahead of our Watershed”. During their art periods, Laura Carter’s art students learned about the watershed and why we should care about it. 1st grades through 5th grades reflected on what they discovered about our local watershed and how we all depend upon a healthy watershed. 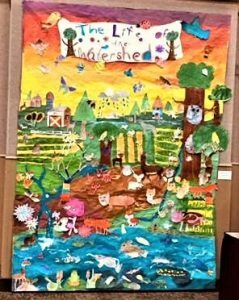 It was a great collaborative effort putting our ideas and artworks together to create a wonderful mural titled, The Life of the Watershed. The mural was well received and Harrison students are very proud of this project.